Monday September 25th 1893 It was a clear cold morning. Will helped me put out a big washing. I then cleaned up the house and got dinner. Will finished the chicken yard. After dinner he went to the valley for the horses and I over the river to help sew. After supper Will hitched to the waggon and we went over for our chickens, got twenty. It was a beautiful moon light night. Tuesday September 26th 1893 I did all my ironing this morning and got the dinner after cleaning up the house. I worked out in the yard with the plants and at fixing up other things all afternoon. Will is at work for [Bostaich?] Wednesday September 27th 1893 I got my work done early and put Wills dinner on the table for him and went over the river to help work on Mothers dresses. We got them all done. I came home before it was very late and got my supper over. weather clear and cool. 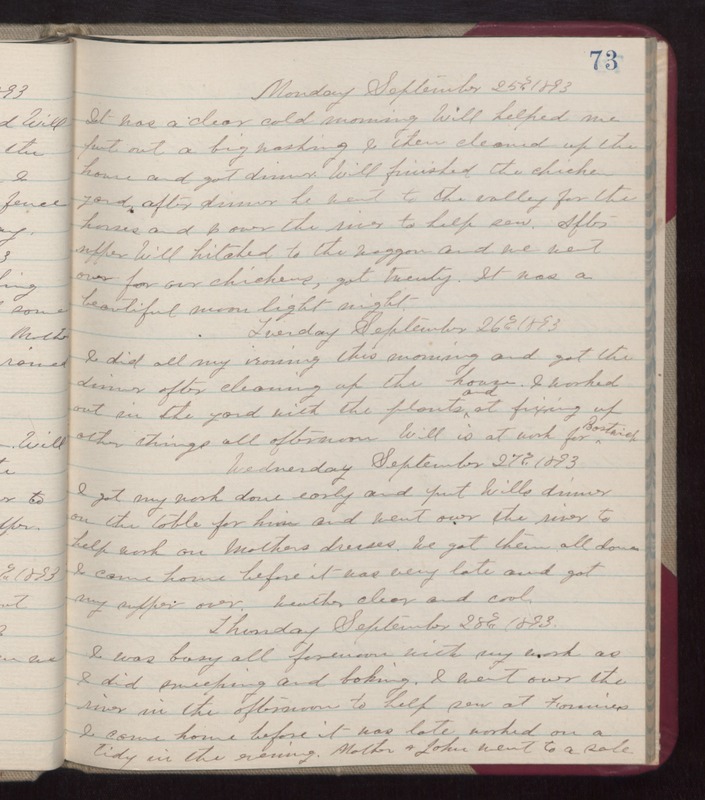 Thursday September 28th 1893 I was busy all forenoon with my work as I did sweeping and baking. I went over the river in the afternoon to help sew at Fannies I come home before it was last worked on a tidy in the evening. Mother & John went to a sale.